WattHead - Energy News and Commentary: From Rhetoric to Reality: Is Obama's Clean Energy Goal Really That Ambitious? From Rhetoric to Reality: Is Obama's Clean Energy Goal Really That Ambitious? Barack Obama's stance on energy issues is not the easiest to discern. 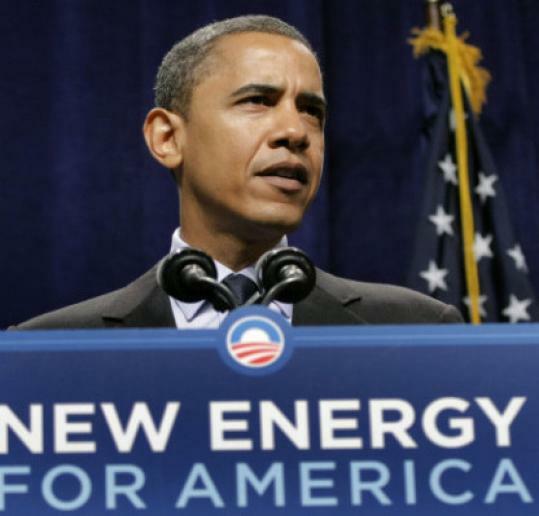 While Obama the orator's language regarding energy has been inspiring - he's eloquently spoken of the need take bold steps and transform America's energy system - it is still not clear that Obama the President's policy ideas are similarly transformative. For a perfect case study, let's look at the seemingly ambitious goal to double renewable energy announced as part of President Obama's stimulus and recovery plan. "To finally spark the creation of a clean energy economy, we will double the production of alternative energy in the next three years." On the surface, this sounds like an ambitious and transformative goal. Doubling alternative energy production in just three years sounds like quite a feat. But, as usual, the devil is in the details, and it all depends on what Obama actually means when he says "double alternative energy production." The key question is this: when Obama says "we will double the production of alternative energy in the next three years," is he really pledging double the production of non-hydropower renewable energy sources, like wind and solar power by the end of 2011? The assumption among pundits and policymakers is that this is what he has in mind. If so, this goal is far less inspiring than the soaring vision of a transformed energy economy painted by Obama's rhetoric. According to the Energy Information Administration (EIA), non-hydropower renewable energy sources (wind, geothermal, solar, biomass) accounted for 72.4 billion kilowatt-hours (kWh) of electricity production in 2007, just 1.8% of the total U.S. electricity supply that year. Doubling electricity production from these sources of alternative energy means bringing non-hydro renewable energy production to 144.8 billion kWh over the next three years. That would mean that after the ambitious sounding goal of "doubling alternative energy production," these sources would still just produce 3.6% of projected 2011 electricity generation. For comparison, EIA's early release of their Annual Energy Outlook 2009 predicts 150 billion kWh of non-hydro alternatives in 2011 (or about 3.7% of projected electricity supply). That's under a business-as-usual "frozen policy" scenario (i.e. they assume no new policies that aren't already on the books and no government spending programs that aren't already appropriated). In other words, the EIA's early release of its annual report on projected energy patterns and predictions estimates that non-hydro alternative energy will double ... even under a relatively conservative business-as-usual scenario. In other words, if this is how the impressive sounding goal of "doubling alternative energy" is calculated, what Obama is essentially pledging is to simply maintain business-as-usual growth in alternative energy production. Now, no doubt the recession will have an effect on private investment in alternative and clean energy, and thus even maintaining business as usual through public spending will help the clean energy sector. However, just keeping things chugging along at their normal rate of growth is far less inspiring than the vision painted by Obama's rhetorical flair: a vision of transformative investments that ignite a clean energy economy and create entire new industries and homegrown jobs. It's also likely that the EIA underestimates where business-as-usual growth would take the clean energy sector. In their baseline scenario, the EIA projects just a 6.2% annual growth rate for wind generation and 21.3% for solar PV. Actual solar PV installations grew 48% in 2007 and total installed wind capacity grew by 45% in 2007 (pdf), indicating just what's possible when the stars are aligned for clean energy. Even at 35% annual growth (a bit cooler than the scorching-hot, almost 50% annual growth rates solar and wind can pull off when they're really cooking), alternative energy production could double in just two years. That means that if Obama were really committed to helping keep this engine of economic growth and energy security rolling, he might even be able to blow right passed his alternative energy goal. This leaves us with an interesting puzzle: why the gap between Obama's rhetoric and his policy? Nate Silver has analyzed polling (commissioned by Politico (pdf)) that shows very high levels of public support in clean energy investments in order to lift us out of recession, and it was the very combination of energy concerns and economic insecurity that the country is experiencing now that propelled voters to pull the lever for Obama in the first place. In fact, if Obama has any mandate beyond revitalizing the economy, it is a mandate to bring new energy to America. And yet why the gap? Has Obama simply co-opted public energy anxiety and Van-Jones-style-rhetoric as a political vehicle for his own ends? We're not yet ready to make that sad conclusion, but it is not simply the timid clean energy goals that cause us to worry. Consider also fact that the stimulus plan could be investing much more in building the new energy economy Obama so eloquently speaks of. Robert Pollin's Green Recovery (pdf) report, for example, outlined $100 billion in smart clean energy projects that America could invest in over the next two years - double what is contained in the current stimulus plan. Perhaps the stimulus was assembled too hastily and Obama simply let an opportunity pass him by. If that's the case, then there's still hope that the situation can be remedied, and Obama can match his policy to his rhetoric. We will soon see an Energy Bill brought to the floor of Congress, a piece of legislation that carries vast potential for securing clean energy investments and establishing a framework for driving down the price of clean energy. Will Obama's policy ambitions rise to the level of his bold rhetoric as he takes his party down the path to a clean energy economy? The answer remains to be seen. It is important that the expectations we all have for clean energy goals from the new administration are met. Recently, the American Institute of Architects, one of my clients, laid out recommendations for President Obama's stimulus plan. Learn more at the AIA's blog, the Angle (http://blog.aia.org/angle/).